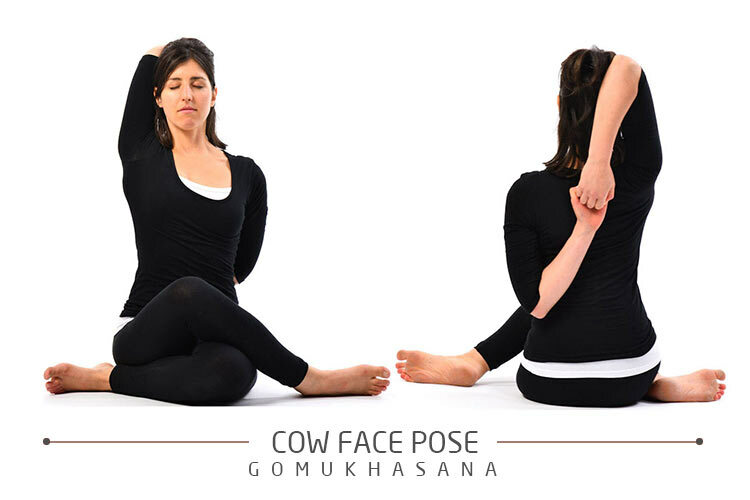 In Sanskrit “Gow” means “Cow”,”Mukha” means “Head or mouth”, “Asana” means “Pose”, The English name of the asana is “Cow Face pose”. Spiritual Awareness : Ajna and Anahat Chakra. Physical Awareness : Hips, thighs, shoulders, chest, knees. Inhale and stretch your left arm to the side and then on exhale, tuck the forearm, tuck forearm in the hollow your lower back, fold the arm upwards, palm facing outwards. Stretch your right arm up above the head, with exhale fold it over the right shoulder. If possible the right and left finger. Bring the right arm behind the head so that the head presses against the inside of the raised arm. Spine is straight and head is back. Stay in this pose about 1 minute. Release the arms, uncross the legs, and repeat with the arms and legs reversed for the same length of time. Remember that whichever leg is on top, the same side arm is on top. Variation: From the full pose, exhale, lean forward and lay the front torso down on the inner top thigh. Stay for 20 seconds, then inhale and come up. Spotlight Effects: Hips, thighs, shoulders, chest, knees. Improves posture by increasing energy, awareness, and opening the chest area. Alleviate tension, tiredness, and anxiety. Relives stiffness of the neck and shoulders. Relieves backache, sciatica, rheumatism, and general stiffness in the shoulders and neck. Alleviates cramps in the legs and makes the leg muscles supple. Serious neck or shoulder problems.